Deontay Wilder is set to take on Bermane Stiverne for the much awaited rematch fight on Saturday, 04 November 2017 at the Barclays Center, Brooklyn in New York, USA. Although most of the build up towards the fight has been around much talked about Joshua-Wilder likely clash set to happen sometime next year. Deontay Wilder however will have to dispose of Bermane Stiverne convincingly this time around to keep his incredible knockout record. The fight will be broadcasted live on Showtime Sports in the US while Sky Sports to broadcast the fight live in the UK. 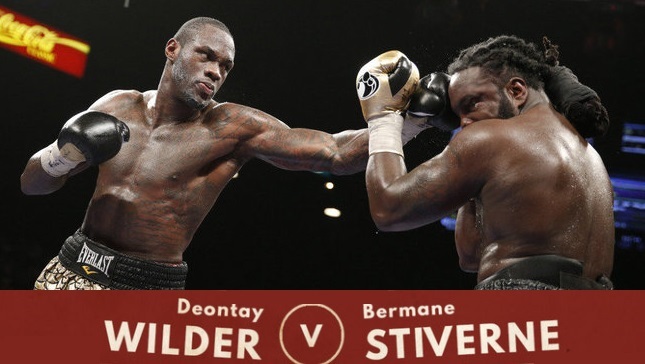 Wilder vs Stiverne TV Coverage: Deontay Wilder vs Bermane Stiverne fight coverage will begin at around 09:00 pm ET with the undercard fights which include couple of exciting clashes. Shawn Porter takes on Adrian Granados while Sergey Lipinets face Akihiro Kondo for the IBF super-lightweight title. SkySports will have the live coverage at around 03:00 am uk time in the early hours of Sunday morning and we will have live links of the fight right here on this page 1 hour before it all begins with the undercard fights. This will be the rematch between the two and the first fight took place back in 2015 when Deontay Wilder won his WBC title beating Bermane Stiverne with the unanimous decision. However, bookmakers have him favourite this time around and the odds on Wilder winning by knockout are surprisingly very low. Can he continue his knockout streak against a very tough opponent who took him all the way to 12 round 2 years ago.